Mrs. Gertraut Graff. Johann Valentin Haidt (1700-1780) Moravian Archives, Bethlehem, Pennsylvania. Johann Valentin Haidt (Heydt) was born in Danzig (Gdańsk), Poland, on October 4, 1700. Haidt came from a long line of goldsmiths learning the trade from his father, Andreas Haidt, a jeweler & sculptor for Emperor Frederick I in the Prussian royal court. Between the ages of 10-13, Haidt studied drawing at the Royal Academy of Arts in Berlin, where his father was an instructor. Miss Anna Rosina Anders. Johann Valentin Haidt (1700-1780) Moravian Archives, Bethlehem, Pennsylvania. In 1754, Haidt left England to become the assistant pastor of a Moravian church in Philadelphia, where he continued to paint & teach painting. By the fall of 1755, he was living in Bethlehem, Pennsylvania, then the center of the Moravian church in this country. 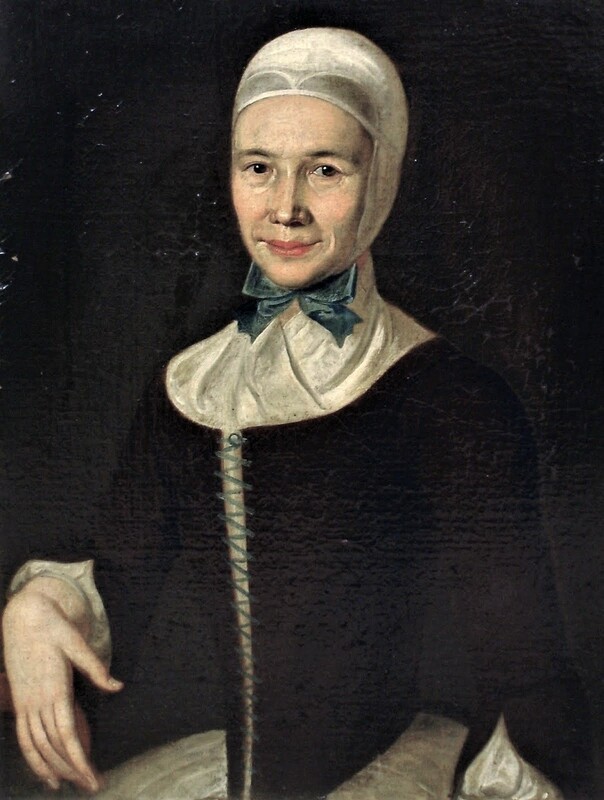 Married Moravian Woman. Johann Valentin Haidt (1700-1780) Moravian Archives, Bethlehem, Pennsylvania. Haidt felt that portrait painting also was important in order to express the spirit within the person. He wrote in his treatise, "One applies all energy to the face, so that it predominates above all...Each figure must immediately depict why is has been drawn...A portrait is beautiful when it is an accurate likeness and when one can see the essence of the person's face and spirit. Therefore, painters who want to paint all faces happy and make the mouths smile make a mistake. The painter must look accurately at the person he wants to paint. If he gets the opportunity to know the subject well, it is a great help to him." 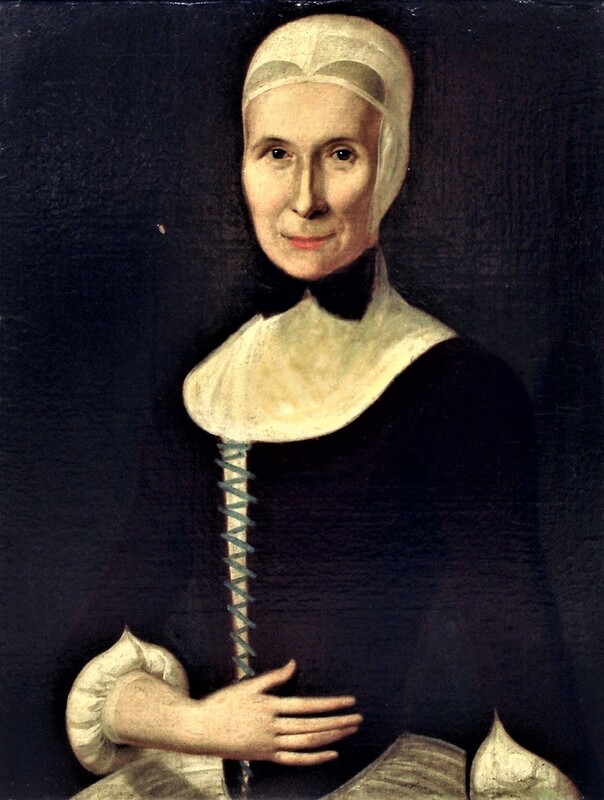 Mrs. Elizabeth Boehler. Johann Valentin Haidt (1700-1780) Moravian Archives, Bethlehem, Pennsylvania. 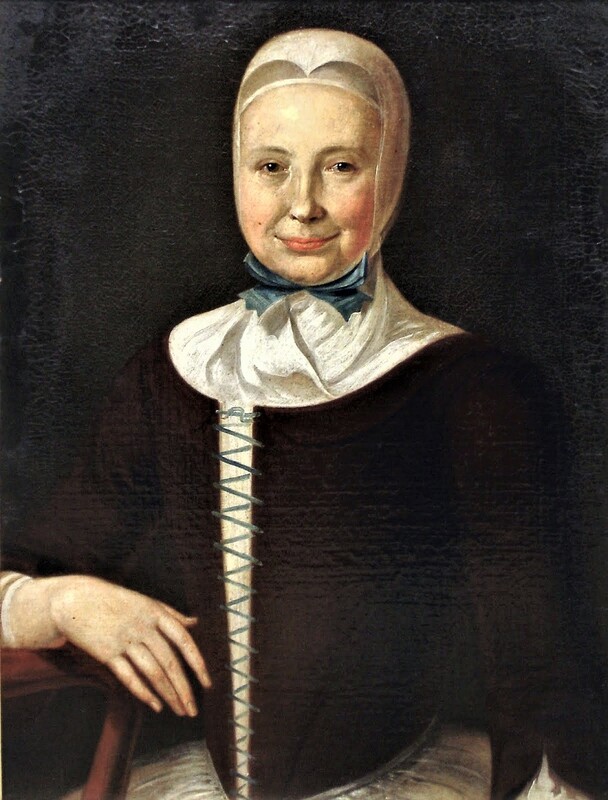 Haidt's portraits of women seem to portray them as spiritual, happy, & content with their roles in Moravian community life under Zinzendorf's leadership. The artist in Haidt did worry about the lack of color choices for his portraits of his plain-clothed congregation. 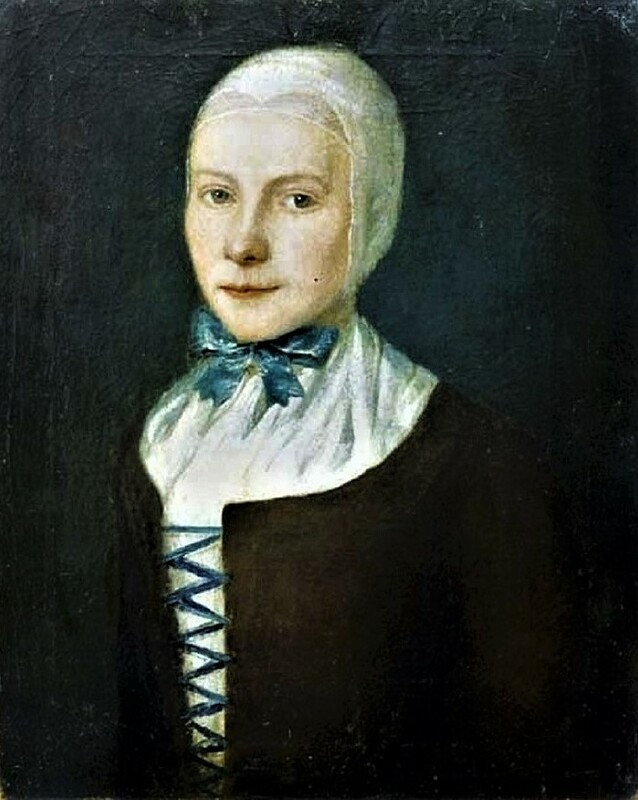 "The clothes should be chosen by the painter according to the complexion of the person, as well as the background, but one will not find it easy to put this rule into practice in the congregation, so a good portrait can never or at least very seldom be painted" of fellow Moravians. The women wore the traditional Mittel-European two-layer headdress or Haube. 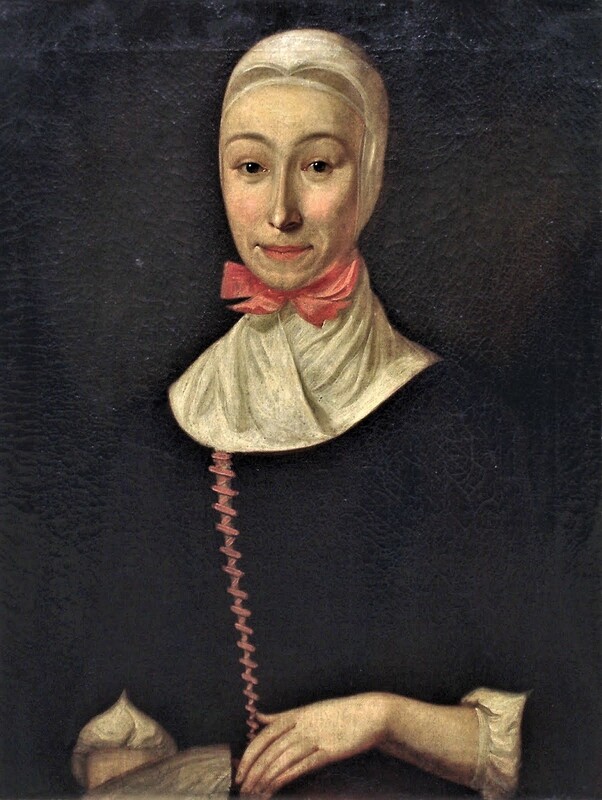 The only colorful aspect of their clothing were the ribbons they wore: red for young girls, pink for eligible maidens, blue for wives, and white for widows. Mrs. C. Theodora Neissen. Johann Valentin Haidt (1700-1780) Moravian Archives, Bethlehem, Pennsylvania. One Pennsylvania reader writes of the costumes, especially the tightly-fitted jackets, "Look at the lacing, the weasel waists, the odd little notch in the sleeve and the way the kerchief is arranged. 'Curiouser and curiouser,' said Alice, quite forgetting her grammar." 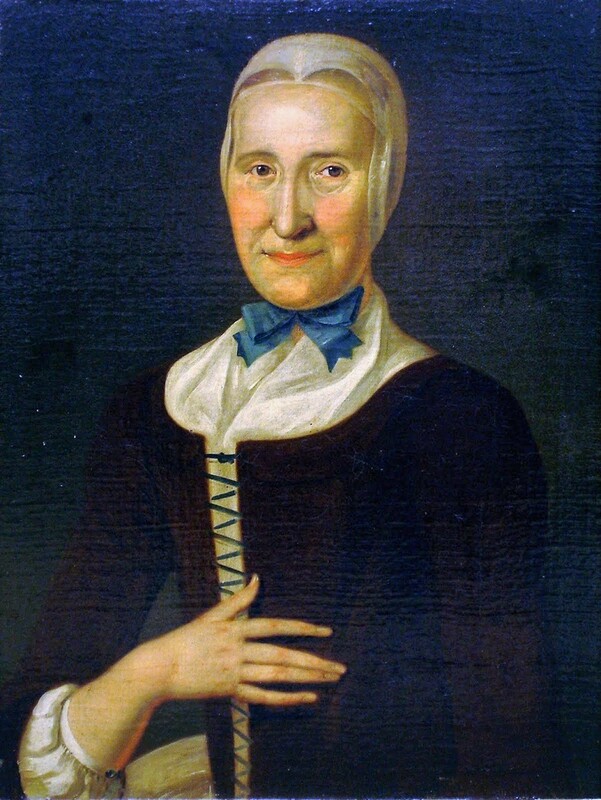 Anna Maria Lawatsch. Johann Valentin Haidt (1700-1780) Moravian Archives, Bethlehem, Pennsylvania. 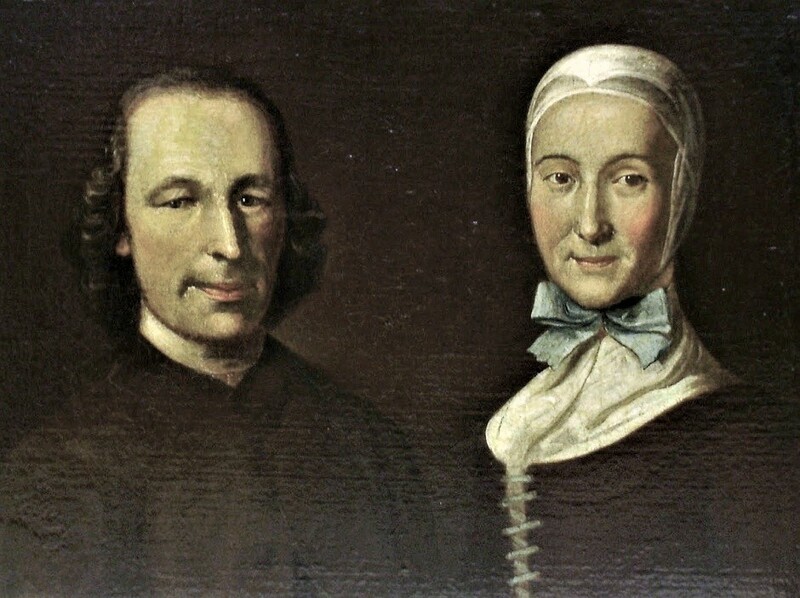 Johann and Susanna Nitschmann. Johann Valentin Haidt (1700-1780) Moravian Archives, Bethlehem, Pennsylvania. 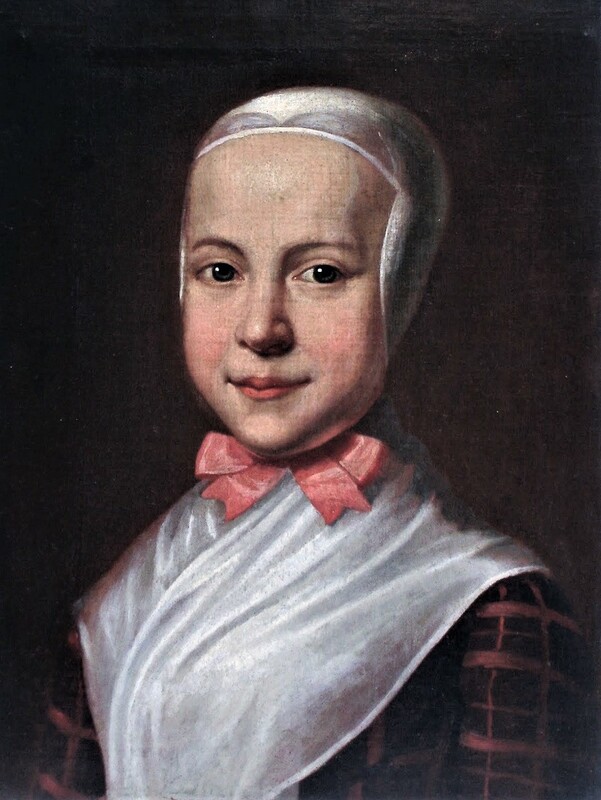 Young Moravian Girl. Johann Valentin Haidt (1700-1780) Moravian Archives, Bethlehem, Pennsylvania. 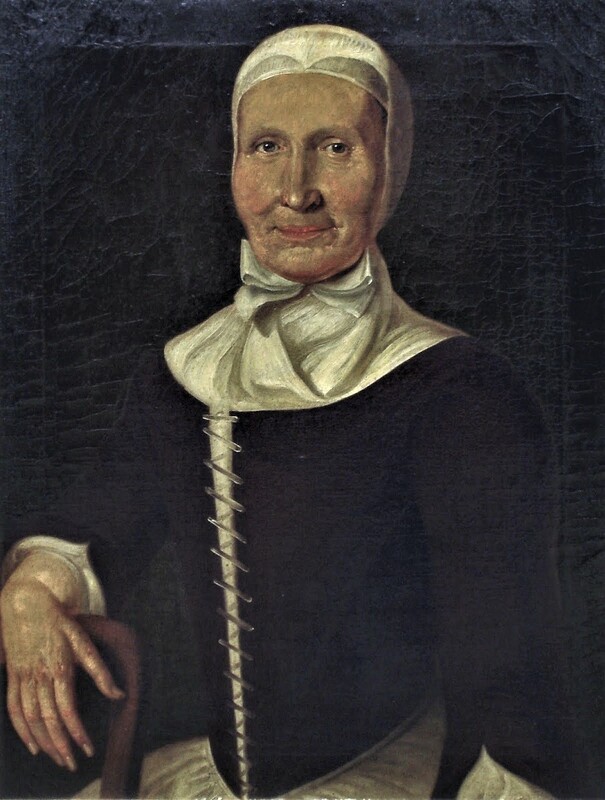 1754 John Valentine Haidt (1700-1780), Johannetta Maria Kymbel (1725-1789) Mrs John Ettwein. Moravian Historica Society, Nazareth, Pennsylvania. Miss Anna Nitschmann. Johann Valentin Haidt (1700-1780) Moravian Archives, Bethlehem, Pennsylvania. 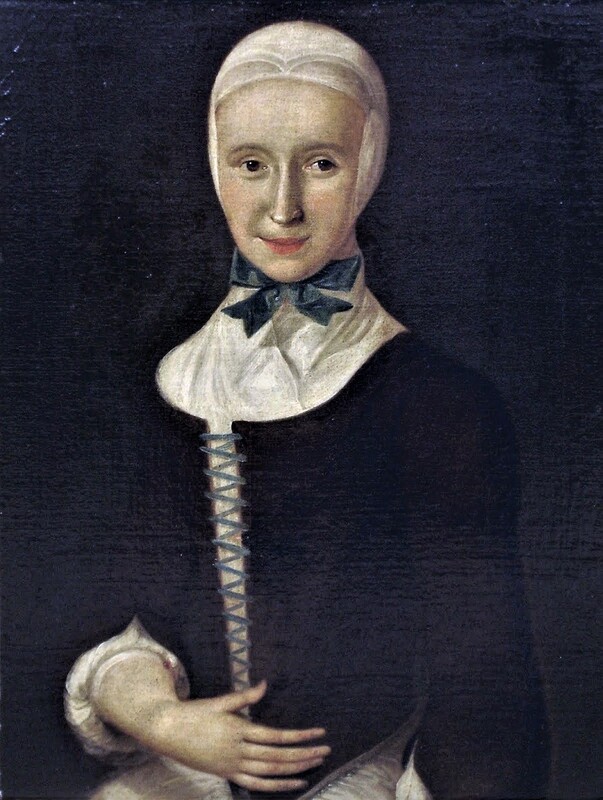 Widow Catharina Huber. Johann Valentin Haidt (1700-1780) Moravian Archives, Bethlehem, Pennsylvania. Faull, Katharine. 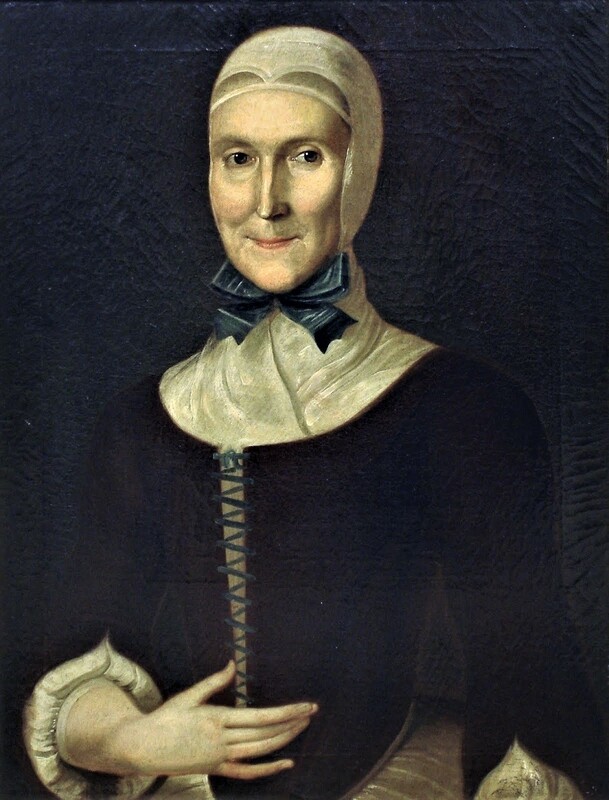 Moravian Women's Memoirs: Their Related Lives, 1750-1820. Syracuse: Syracuse University Press, 1997. Smaby, Beverly Prior. 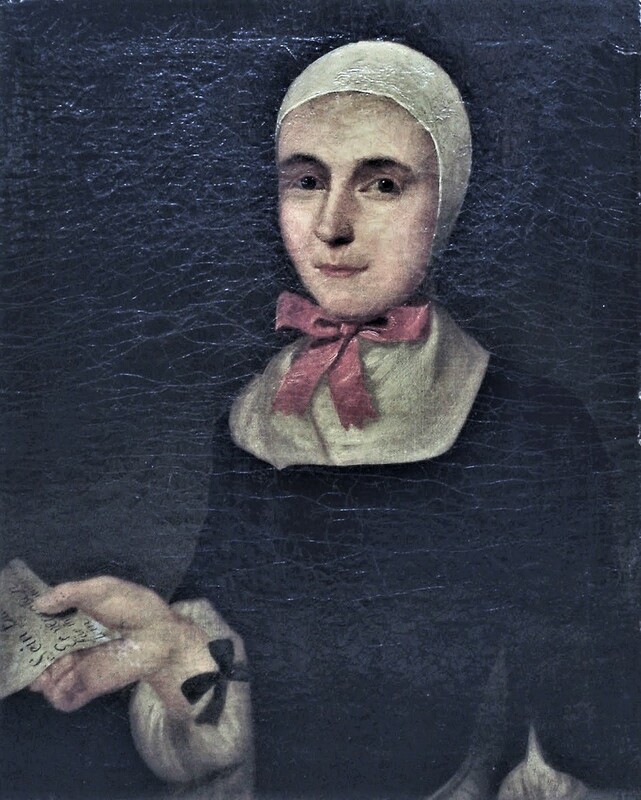 "Female Piety Among 18th-Century Moravians." Pennsylvania History 64 (1997): 151-167. 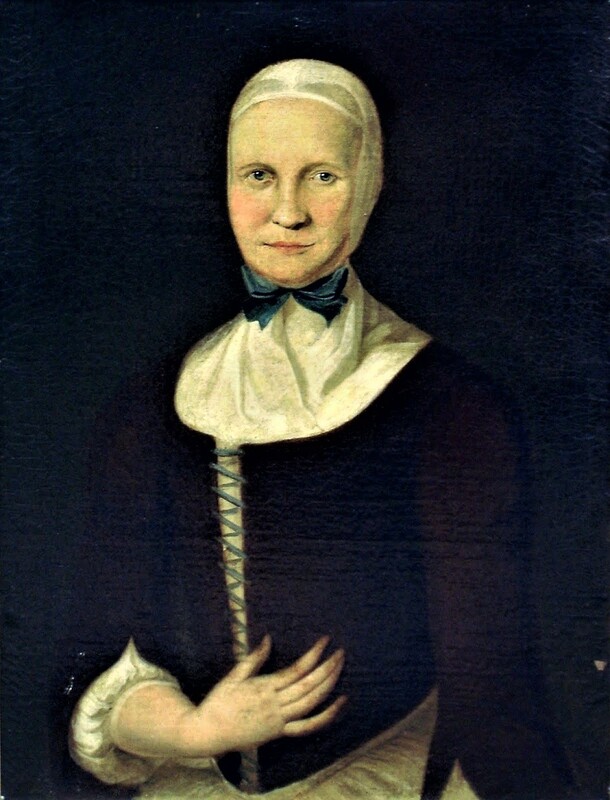 Sommer, Elisabeth W. Serving Two Masters: Moravian Brethren in Germany & North Carolina, 1727-1801. Lexington: The University Press of Kentucky, 2000. Vogt, Peter. "A Voice for Themselves: Women as Participants in Congregational Discourse in the 18th-Century Moravian Movement." In Women Preachers and Prophets through Two Millennia of Christianity, edited by Beverly Mayne Kienzle and Pamela J. Walker, 227-247. Berkeley: University of California Press, 1998.